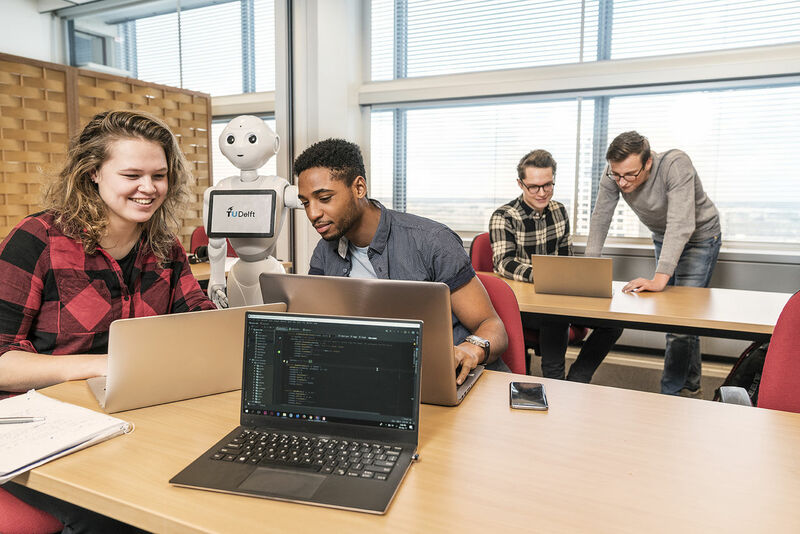 To ensure the quality of the bachelor degree programme Computer Science and Engineering at TU Delft, a Numerus Clausus (fixed capacity) has been introduced. For the academic year 2019-2020 this capacity is set at 500 new bachelor students. The deadline to apply is January 15, 2019. Self-driving cars, smartphone navigation, personalised offers based on your surfing behaviour, healthcare robots and searching through films en pictures. During the Computer Science and Engineering degree programme, you will learn how to develop software and all on data processing for the intelligent systems of today and the future. This could include medical systems, security and perhaps even the new YouTube. Mathematical analysis and modelling, logical reasoning, programming algorithms and working with concepts of programming languages are all important here, and so is collaboration. This is why, every half a year, you will work on a project with a group of fellow students, designing ‘things’ like an intelligent bot in a computer game. The difference between Computer Science and Engineering and Computer Science is much smaller than you might think. In Computer Science and Engineering you learn to understand the material, and also how to apply the theory in its technological context.